With its s ynchronized level wind system it improves line lay and castability. This is one of the TOP OF THE LINE AMBASSADEUR ROCKETS, no upgrades are needed for this beauty! Included also is all the original paperwork, and schematic. 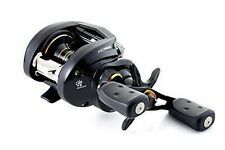 5 out of 5 stars - AMBASSADEUR 6500CS PRO ROCKET BLACK EDITION PR-6500BE ABU GARCIA NEW IN BOX!!! 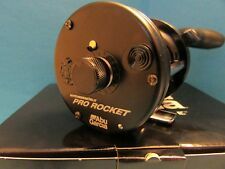 9 product ratings9 product ratings - AMBASSADEUR 6500CS PRO ROCKET BLACK EDITION PR-6500BE ABU GARCIA NEW IN BOX!!! 2 new abu Garcia baitcasters 1-revo x 8 bearings 6.8:1 gr rh 1- promax 8 bearings 7.1:1 gr rh. 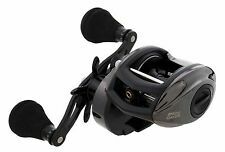 New ListingABU GARCIA 6500 BEAST AMBASSADEUR NEW MINT BUY IT NOW PRICE!!! Built in the famous Abu factory in Sweden nothing was spared in it's production. The graphics on the side plate says it all, it is a BEAST of a reel! Included also is the schematic and Abu paperwork. 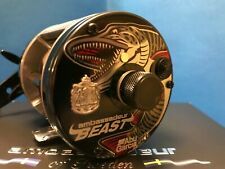 5 out of 5 stars - ABU GARCIA 6500 BEAST AMBASSADEUR NEW MINT BUY IT NOW PRICE!!! 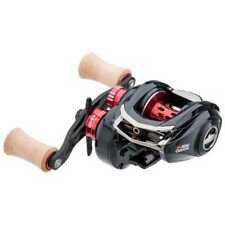 9 product ratings9 product ratings - ABU GARCIA 6500 BEAST AMBASSADEUR NEW MINT BUY IT NOW PRICE!!! Abu Garcia Ambassadeur 5000C Vantage Plus Fishing Reel Made in Sweden. Reel is in very good used working condition. Please check out pics for best description. Free shipping to the lower 48 states. Thank you for looking!!! Abu Garcia PMAX3 Pro Max Low-Profile Baitcast Fishing Reel. The machined double-anodized aluminum spool provides added strength without adding excess wright. Power Disk drag system. New ListingVintage Abu Garcia Ambassadeur 5500 C Black - Baitcast Reel #790804 - LQQK !!! I have been fishing these reels for crank baits for a while now and love them. They are right handed retrieve and have a 5.4:1 retrieve. Beautiful reels for this money. 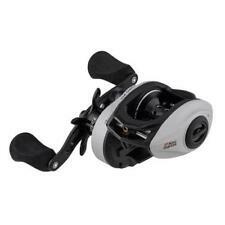 ABU GARCIA Revo 4 X Inshore left hand baitcast reel. Mono capacity: 12/145. Braid capacity: 30/140. We stand behind our products. Max Drag: 18 lbs. For sale is a very nice reel in great shape. Has just a little boat rash. The number on the foot is 770605. A VERY NICE ABU SWEDEN REEL THAT WORKS PERFECT. HAS A FEW MINOR MARKS FROM USE BUT NO DENTS OR BAD DINGS. A NICE COLLECTOR QUALITY OR JUST A GREAT USER FOR THEM NORTHERN'S OR MUSKIES. ALL OF MY LATER MUSKY LURES ARE STILL A MIN. Abu Garcia Promotional Moruum Ambassadeur Fishing Reel Wrist Watch With Case. I believe they were made around 2000. The case and instructions say China. It doesn't say on the watch where it was made. Multi disc drag system gives smooth drag performance. Right Handed. Synchronized level wind system improves line lay and castability. 6 pin centrifugal brake gives consistent brake pressure throughout the cast. 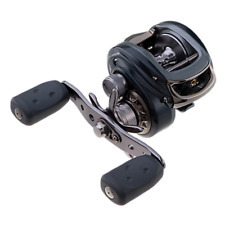 Abu Garcia Right-Handed Black Max Low Profile Baitcast Reel in Excellent Condition. This reel works fine. Factory Refurbished. This Ambassadeur Ultra Cast UC5600CA reel was made in Sweden and is in Excellent Shape and functions perfectly. The gold trim label on the bottom of the right face plate has a wrinkle and very minor scratch on the face plate on the right. Abu Garcia Power Handles are great for replacing the smaller handle on your Abu Garcia fishing reel. 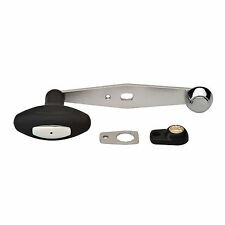 They are constructed of aluminum with a large, comfortable rubber handle knob. These are very easy to put onto your reel. Abu Garcia Power Handles Fit all ambassadeur round reels up to 6500 size, right or left handed. They are available in black and silver. .
ABU GARCIA Ambassadeur Record 60 HC high capacity right hand baitcast reel. Made in Sweden. Line capacity: 17/225. We stand behind our products. LEFT handed baitcast reel. ABU GARCIA Ultra MAX 3. We stand behind our products. Classic reel in excellent condition. This is a Ambassadeur 5501 CL3 Left Handed baitcast New in the Box. Abu Garcia® MaxToro 50. Carbon Matrix drag system provides smooth, consistent drag pressure across the entire drag range. Large PVC knobs provide greater grip. Abu Garcia Ambassadeur 6500C3 2-Speed Baitcasting Reel in lightly used condition. The Reel works as designed. Great condition reel in working condition. The reel could use some light cleaning but is very smooth. I did lightly oil the reel with Lucas reel oil to ensure that its working great. Please look at all pictures as they are part of the description and show the condition of the reel. Thanks for looking and please check out my other listings. Abu Garcia Revo MGX Casting Reel 7.1:1 Right Hand Retrieve. The reel has a little wear on top and has a little cosmetic piece missing surrounding the brake adjustment but the reel and brakes are still 100% functional and otherwise in perfect mechanical working condition. Still a great reel, just has a few cosmetic imperfections. Let me know if you have any other questions, thanks! 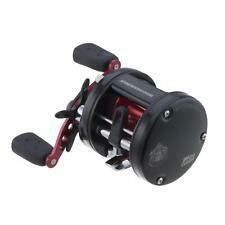 Abu Garcia Alx Baitcast Reel 9Bb 6.4:1 Size 120/12. Condition is New. Shipped with USPS Priority Mail. Up for sale is a Abu Garcia Ambassadeur 6500CS. VINTAGE ABU GARCIA AMBASSADEUR 2500C BAITCASTING FISHING REEL!! Reel has been very well taken care of. Reel is marked 760900 on bottom of reel seat. REEL IS IN EXCELLENT CONDITION, SWEDISH ENGINEERED. This is a new Abu Garcia Ambassadeur marked as model number 6500TCCM Carpmaster 14. The color of the reel looks like a blend of olive green and gold. This reel is brand new in the box. Please use the picture of the box for your information as far as the specifications and if you have nay more questions please feel free to ask. Shipped with USPS Priority Mail. Very good plus to Excellent shape. Crank, hardware and star are in great shape. Stickers great shape. Spool is in excellent shape and sits and spins well. The Super-Sized and Zoom-Able pictures are of the reel which show it for your close inspection. 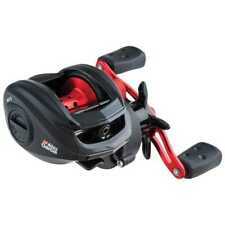 Abu Garcia Cardinal S Spinning Fishing Reel cardinal s-10. Condition is Used. Shipped with USPS First Class Package. This High Speed Ambassadeur 5600CA reel is in Excellent Shape and functions perfectly. If it wasn’t for a little bit of a scrape on the bottom left side of the face plate the reel would be in Perfect Condition. ABU GARCIA AMBASSADEUR 5500C FISHING REEL. I s h i p fast. ABU GARCIA AMBASSADEUR 6500C3 CT MAG GUN METAL CHROME GREY NEW MINT IN BOX!!! 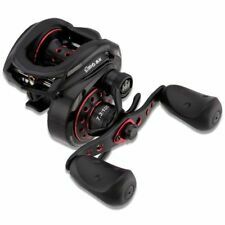 "Abu Garcia 1292530 ORRA2 SX Low Profile Reel, Standard Speed, Right Hand"
Abu Garcia baitcasting reels work for many types of fish as well as situations, including lake, ocean, and river fishing. Although many reels are designed to be used by right-handed anglers, there are many models built for left-handed people as well. These reels are also designed for many different types of fishing, including freshwater, saltwater, and bass fishing. What are some features of Abu Garcia reels? When you are searching for the right reel that meets all of your angling needs, you will discover that most Abu Garcia reels are outfitted with an aluminum spool. They are also outfitted with an anti-reverse feature designed to prevent the reel from turning backward instead of engaging the drag. An enhanced oscillation system in some of these reels provides you with the means of ensuring that the line is distributed when being wound, which helps to curb the number of tangled lines and drag you experience when taking your rod out into the water. Some additional features you can expect on a selection of these models include an enhanced gear train for added power, a gear support system, and a line counter. What is the gear ratio of a reel? When you are selecting an Abu Garcia reel, the gear ratio of the item is one of its most important features, as this helps to determine the speed that the line can be reeled in, which can make a difference depending on what type of fishing that you are doing. The gear ratio of a baitcast reel is listed as something like 5.1:1 or 7.1:1, which indicates how many rotations the spool makes for a single turn of the reel (i.e., 5.1 and 7.1, respectively). The higher the number, the faster you will be able to reel in the line, which also corresponds to the speed of the fish. 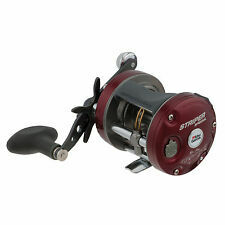 This type of fishing reel allows the spool to rotate as you cast, which means the line that is pushed out depending on the inertia you provide it with. Once you have practiced with this type of fishing reel, you will be able to place a lure in the location that you wish to fish from and be able to stop the lure in a second, allowing you to get a handle on a bad cast immediately and retrieve it. 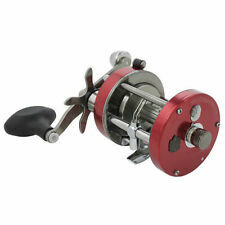 There are two types of baitcasting reels: low-profile reels and round reels. A low-profile reel is a lightweight reel that offers an ergonomic design and is a bit smaller than a traditional round reel. Though they are low-profile, the Power Disk system is designed to promote smooth drag and control when casting. Low-profile models include the Revo and the Pro Max lines. A round fishing reel, such as the Ambassadeur line, is often used by anglers for trolling and jigging purposes. This heavier reel comes in different sizes to meet a variety of needs, and features like a synchronized wind system improve casting and drag for an all-purpose baitcasting experience.